All of those orange, cyan, and yellow dots represent digital ants fighting for supremacy. This is a match to see who’s AI code is better in the Google backed programming competition: The AI Challenge. Before you go on to the next story, take a hard look at giving this a try for yourself. It’s set up as a way to get more people interested in AI programming, and they claim you can be up and running in just five minutes. Possibly the best part of the AI Challenge is the resources they provide. The starter kits offer example code as a jumping off point in 22 different programming languages. And a quick start tutorial will help to get you thinking about the main components involved with Artificial Intelligence coding. The game consists of ant hills for each team, water as an obstacle, and food collection as a goal. 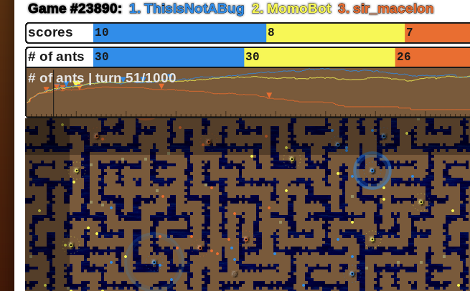 The winner is determined by who destroyed more enemy ant hills, and gathered more resources. It provides some interesting challenges, like how to search for food and enemy ant hills, how to plot a path from one point to another, etc. But if you’re interested in video game programming or robotics, the skills you learn in the process will be of great help later in your hacking exploits. [Phillip] and the crew at Voltaic Systems took a look at the Sunnan solar powered desk lamp from IKEA a while back, and while they thought it was pretty useful, there were definitely some things they wanted to change. First on their list of revisions was to increase the capacity of the stock battery pack. Taking the lamp apart and unscrewing the pack’s lid revealed a set of 3 AA cells, which they swapped out for higher-capacity models with more than double the watt-hour rating. A beefed up battery is a good start, but the lamp’s tiny solar panel has no hope of topping off the batteries outside of Death Valley. To ensure that they get a nice full charge, a small jack was wired into to the battery pack, allowing the group to connect any size external solar panel they pleased. 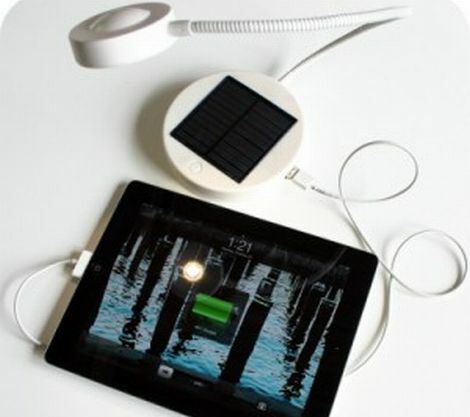 Finally, [Phillip] and Co. wanted the ability to charge an iPad2 from the lamp’s battery pack. They hacked in a small USB connector and a slightly modified MintyBoost board to provide a little extra juice to their tablet. While they are still testing the modifications, they say that everything is working nicely, citing that the extra battery capacity and charging abilities are a great addition. Halloween is the time of year where you can dress up as a pirate, muppet, or superhero and no one will bat an eye. During this holiday of expanded social permissiveness, [Nbitwonder] decided that building an Arc Reactor from Iron Man would be appreciated by his engineering cohort. The ‘body’ of the reactor was manufactured on the RepRap Mendel we covered from beginning to end. A few minutes with Google Sketchup was all that was needed to generate the files and send them to the printer. In a few short hours, [Nbitwonder] had the body of his Arc Reactor. The board design was thrown together in Eagle and etched. 11 blue SMD LEDs were thrown into the mix along with some borrowed resistors. Pieces of a hard drive spindle and a little bit of wire rounded out the parts list, and everything was assembled with the DIYers favorite tool, the hot glue gun. Not a bad job for a few hours of work. The files for the Arc Reactor are up on Thingiverse along with a Flickr photoset. Here’s a nice little circuit that will drive a motor and allow you to stop its rotation, giving your robot a set of brakes. It’s part of [JM’s] post about the in’s and out’s of building microcontroller friendly motor controllers (translated). This particular setup is a half H-bridge. It allows you to drive the motor in one direction only. The MOSFET used on the ground-side of the motor doesn’t actually need to be there. This is the brake which let you electronically stop the motor from spinning. Without it, the motor will keep turning under its own momentum when the half-bridge is shut off. Depending on the application this can be a big problem. There’s a great demonstration of the circuit braking a fast spinning motor in the video clip below the fold. It is possible to use this driver with PWM, but [JM] has some warnings about inbuilt functions like FastPWM. Make sure you read his admonition, and if you need a refresher don’t miss this Hackaday video segment. Our own [Mike Szczys] recently sat down and put together a great tutorial on building a Larson Scanner. The ubiquitous circuit is usually one of the first few projects on a budding hackers list of things to build, since they are just so darn fun. Simple versions of the scanner sweep back and forth lighting the LEDs without any sort of transition between them. The configuration most familiar to us all as featured in Knight Rider and Battlestar Galactica are a bit more complex, and have a fading trail of light that follows behind the leading edge of the sweep. [Mike] notes that this fading is traditionally accomplished through the use of capacitors, which cause the light to gradually fade as the animation sweeps across the LED array. He decided to take a different route with his circuit, relying on PWM control of the LEDs instead. Mike put together a simple circuit using an ATmega168, a handful of resistors, and of course, an array of LEDs. Utilizing interrupts and PWM, he was able to accurately recreate the iconic light sweep without the use of any capacitors. One big benefit to his design aside from the lower component count is the fact that he can easily adjust the speed of the sweep as well as the fading properties with a few small code tweaks. 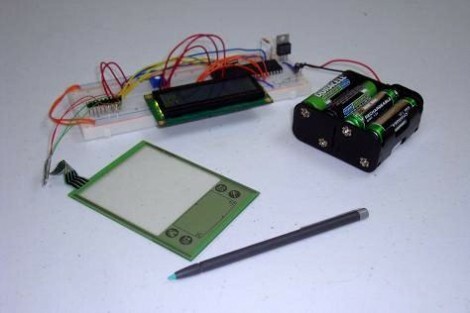 Be sure to check out his blog at some point, where he shares his code, some circuit diagrams, and plenty more details on how his scanner was built. In the meantime, take a look at the video below to see the result of [Mike’s] work. [Greg] was looking for something to build using his recently acquired Arduino, and with Halloween approaching, he thought a cool light display would make a great project. He browsed around online and found this tutorial that shows how to build a chorus of singing pumpkins controlled by a computer’s parallel port. Since he didn’t have any computers with a parallel port kicking around anymore, he decided to try his hand at recreating it with an Arduino. [Greg] gathered eight light up Jack-o-Lanterns, along with a handful of relays and other miscellaneous components. He wired up the relays to trigger each individual pumpkin’s built in light when switched by the Arduino. He sat down and carefully listened through “This is Halloween” from The Nightmare Before Christmas, choreographing each of the pumpkins to take on the voice of one of the movie’s characters. 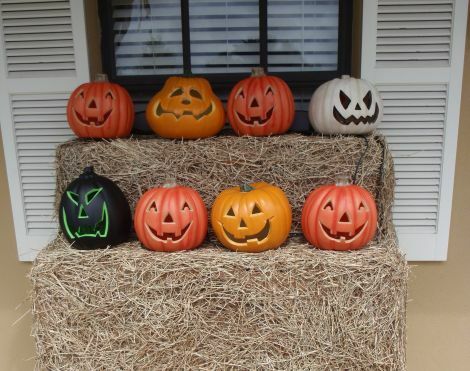 When the show begins, the display transforms from a group of unassuming pumpkins with candles a-flicker to a chorus of ghouls extolling the virtues of Halloween. It really is fun to watch, so be sure to check out the video below. If you’re looking to throw together a quick display before the big day rolls around, [Greg’s] source code and diagrams should get you headed in the right direction.